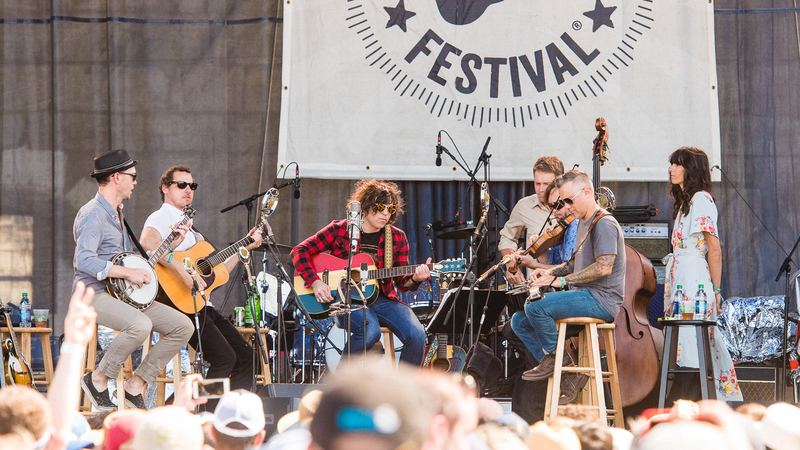 Ryan Adams is well on his way to becoming a Newport Folk regular. For his 2016 set, Adams brought along some special guests: the modern bluegrass band The Infamous Stringdusters and their frequent collaborator, singer-songwriter (and accomplished viral-video kazoo player) Nicki Bluhm. The seven musicians arranged themselves in a semicircle on stage, lending the performance the intimacy and jollity of a family jam session. The group's hand-spun, Appalachian-tinged renditions of Adams' songs — plus a couple metal covers — were punctuated by his goofy stage banter, which contributed to that overall sense of bonhomie. Adams affably chided the other players for setting audience expectations too high and paused mid-strum during "New York, New York" to shout merrily at the two military-looking choppers that were thrumming away over the harbor. He even improvised an entire song, which we'll go ahead and title "Frightened And Rabid," based on a phrase he thought he'd heard yelled from the crowd. As Adams invented silly lyrics about hydrophobia off the top of his head, Bluhm and the Stringdusters looked as visibly amused as the Newport audience. ADVISORY: This performance contains profanity. "To Be Young (Is To Be Sad, Is To Be High)"
Copyright 2016 NPR. To see more, visit NPR.